Greg Monroe of the Detroit Pistons takes a shot against the Dallas Mavericks at American Airlines Center on Jan. 7 in Dallas. 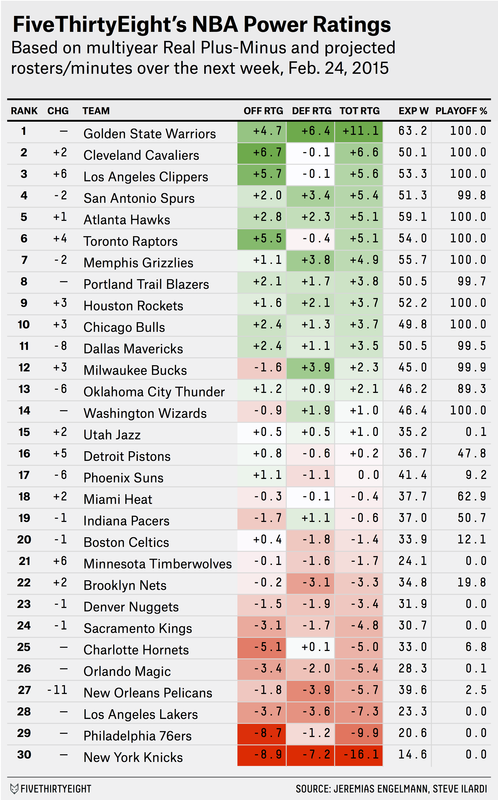 After a week’s hiatus because of the All-Star break, we’re back with FiveThirtyEight’s NBA Power Ratings. There are more than a few trade deadline-related changes to the rankings this week, but before I get to those, a quick explanation of how these numbers work: Teams are ranked according to a projection of their strength over the upcoming week using Real Plus-Minus (RPM) player ratings provided by Jeremias Engelmann and Steve Ilardi. For more details on these numbers, see our introductory rankings post. In many ways, ranking the league after a reshuffling of players — like Thursday’s trade deadline — is precisely what power ratings such as these are intended to do. Because they’re based on the underlying talent of the players on each team’s roster, they ought to be able to account for player movement more quickly than ratings that require the new-look teams to play together a bunch of times. As SB Nation’s Paul Flannery noted, this trade deadline didn’t really make much difference despite all the chaos in the final hectic minutes. Sure, the top team, Miami, added about 2.4 wins over the rest of the season, and Phoenix brought up the rear with a loss of more than 3 WAR when the dust settled. The moves may have kept the Heat afloat for the playoffs (especially in light of the subsequent news that Chris Bosh would be lost for the season with blood clots) and signaled the death knell for the Suns’ postseason chances. But the rest of the biggest movers and shakers on deadline day either had already locked up a playoff slot (Washington and Oklahoma City took steps back but are near 100 percent playoff probability by our projections anyway) or didn’t have a prayer no matter what they did (the Celtics, for all their improvements on deadline day, are still staring at a mere 12.1 percent chance of making the playoffs). The exception to this might be the Detroit Pistons. Two weeks ago, the Pistons clung to a meager 9.9 percent probability of making the playoffs, according to our model. Now they have a 47.8 percent chance of making the postseason and have jumped from 21st to 16th in the power rankings — some of that thanks to the 1.4-WAR boost they picked up at the trade deadline with Reggie Jackson (an upgrade made doubly positive by the discarding of sub-replacement level guard D.J. Augustin). Aside from the Pistons, however, it seems as though few of Thursday’s moves will upend the playoff picture in either conference. At any rate, many of the trades yielded positive WAR simply by jettisoning a poor player from the roster. Take, for instance, Sacramento’s trade of Ramon Sessions to Washington. It netted a solid player in return — Andre Miller is expected to generate 0.8 WAR for the Kings over the rest of the season — but removing Sessions was the bigger windfall in terms of 2014-15 WAR. Sessions’ -5.1 predictive RPM combined with an expectation of 17 minutes per game to potentially deliver -1.0 WAR to Sacramento before it traded him away. As for the rankings themselves, the New Orleans Pelicans were the biggest movers since two Mondays ago — and in a very bad way. They lost all-everything forward Anthony Davis to a shoulder sprain that will cost him several weeks of action, which coupled with an ongoing injury to Jrue Holiday — and the addition of RPM disaster Norris Cole — to drop the Pelicans 11 ranking slots. RPM says their depleted roster projects to be the fourth-worst in basketball over the next week. The Dallas Mavericks dropped eight slots in this edition of the rankings. Adding Amar’e Stoudemire didn’t help, but the biggest changes were an injury to Chandler Parsons and the return of statistical enigma Rajon Rondo to their lineup. Rondo’s having a subpar season by the numbers, and short-term RPM gives him a rating near the replacement level. But at least Dallas is still 99.5 percent likely to make the playoffs, according to our simulations. Looking for good news? The Los Angeles Clippers rose six spots in the rankings from two weeks ago. Usually changes to the power ratings are due to player movement, injuries or other reallocations of minutes, but in the case of the Clippers, the improved play of Jamal Crawford has also played a role. Crawford still carries a negative RPM rating, but he’s averaging 22.8 points per game over his last four outings and has been present for some of the Clippers’ best basketball — they’ve averaged a +17.5 scoring margin per game with him on the floor over the past two weeks.